Winter Hiking & Snowshoeing | Mirror Lake State Park Visitor's Guide - Baraboo Wisconsin. While winter hiking and snowshoeing are allowed at Mirror Lake State Park, most trails are groomed for cross country skiing and non-skiers are encouraged to stay off of them. The solution for folks wanting to enjoy a winter hike while still having the guidance of marked trail may be a visit to Rocky Arbor State Park. In the winter Rocky Arbor State Park is not staffed, however hikers & snowshoers may park outside the front gate (not blocking the road of course) and trek in. The nature trails and roads throughout the park and campground can make for a wonderful winter experience. The nature trail has two vertical staircases and require a bit of caution in the winter. Go to our maps page for a printable Rocky Arbor State Park Map. 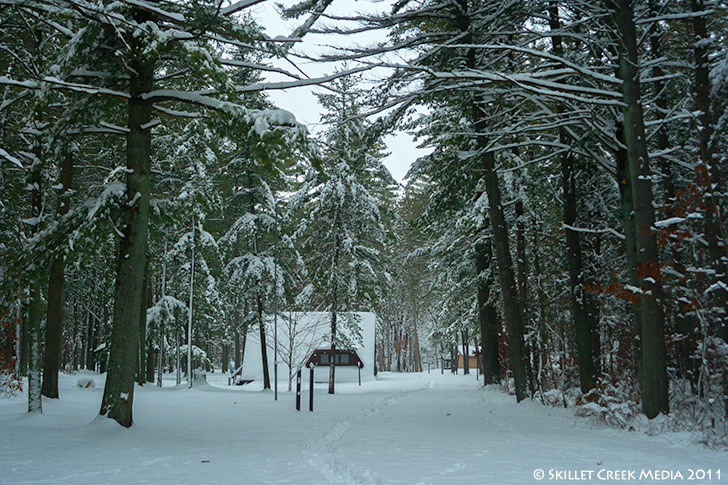 It’s worth noting again that you are on your own at Rocky Arbor State Park in the winter. There is no staff nearby if you get into trouble and no quick access to shelter or heat of any kind. Proceed with caution. TRAIL CONDITIONS! – Click here for trail reports. Need to Rent Snowshoes? Contact Wildside Adventure Sports in Baraboo!